My sister sent me this pattern and I thought it would look so cute in my sewing room. Unfortunately this means I won't be able to use the "I lost track of time" excuse when I'm sewing anymore. 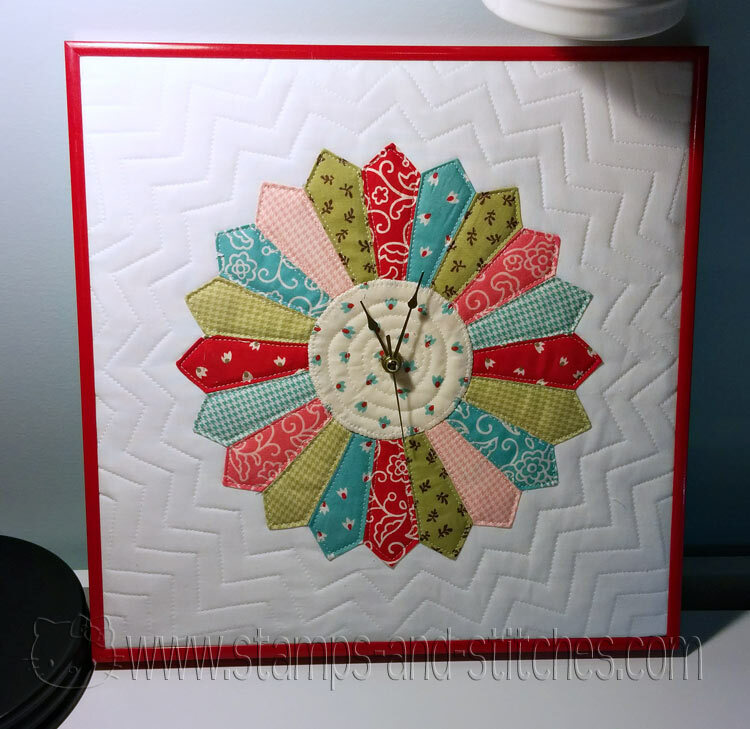 The clock is 12" square and I used a scrapbook frame for it (minus the glass). I made a dresden plate block using the Easy Dresden ruler. After adding the center circle I quilted a wonky spiral in the center, around each petal of the dresden plate, and echo quilted the background, using the edge of the presser foot as a guide (it's a wide presser foot). The fabric is Moda's Sophie and white Kona cotton. It was a lot of fun to make-almost instant gratification. Plus it's useful. 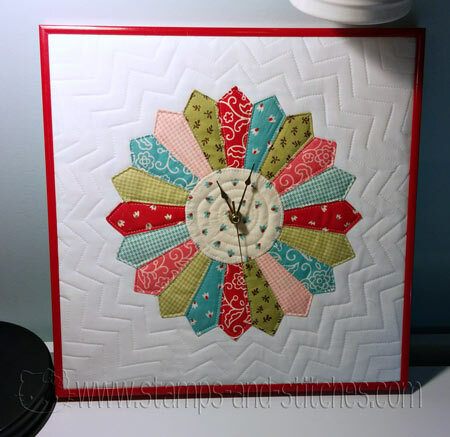 I just wanted to say that I love your clock block! how did you add the clock works? Thank you for sharing your creativity, its just adorable! Hi Susan. The clock works went in fairly easily except that the whole thing was kind of thick. So I had to push hard to get the nut on the back. If I could have found a clock with a longer shaft it would have been a lot better but I'm not sure if they make them that way. But basically, I cut a hole in the front where the clock works go and also a hole in the board that holds everything in. Push the clock works in and there's a nut that screws onto the back to hold everything in securely.